A “take-out” approach to entertaining has nothing to do with fast-food meals wrapped in paper at the home of Chicago designer Frank Ponterio and his wife, Becky. When this couple hosts an intimate dinner, there’s a good chance it won’t be in the dining room of their 1920s suburban home, designed by prolific architect David Adler. Instead, the meal is often taken out to a separate structure they call the “Pour Room.” Just steps from their back door, the Pour Room was originally the carriage house of what was once a 500-acre estate, and it has become the go-to spot where Frank and Becky now enjoy casual dinners and indulge in their extensive collection of wine, housed in temperature-controlled units at one end of the room. Outlined in worn brick, the interior walls of the small, narrow Pour Room beg for furniture that supports its country charm. Weathered café chairs skirted in ivory-colored linen surround a rough-hewn French farm table that has a perfectly imperfect finish marked by dents and scars. 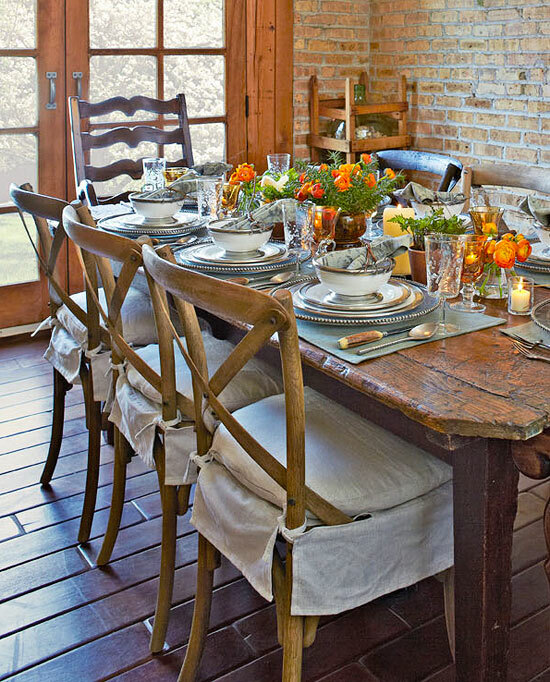 Frank opted not to use a tablecloth that would hide its rugged patina. 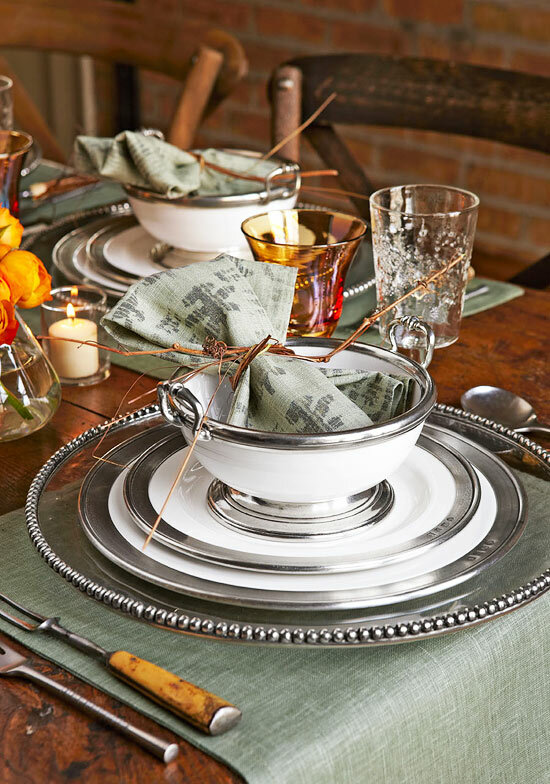 Instead, sage green place mats establish each setting. Wanting to enhance the Pour Room’s old world aesthetic, Frank chose sturdy porcelain dinnerware that sports a handsome pewter rim. The substantial pieces were an ideal choice for a hearty menu of cauliflower soup, traditional Osso Buco, a spinach salad with grapefruit, and warm spice cakes. Voluminous glass service plates elegantly frame the hefty pewter-edged dinnerware. The napkin—a faded, Batik-like print in sage green—is tied with vines clipped from the outside walls of the carriage house. 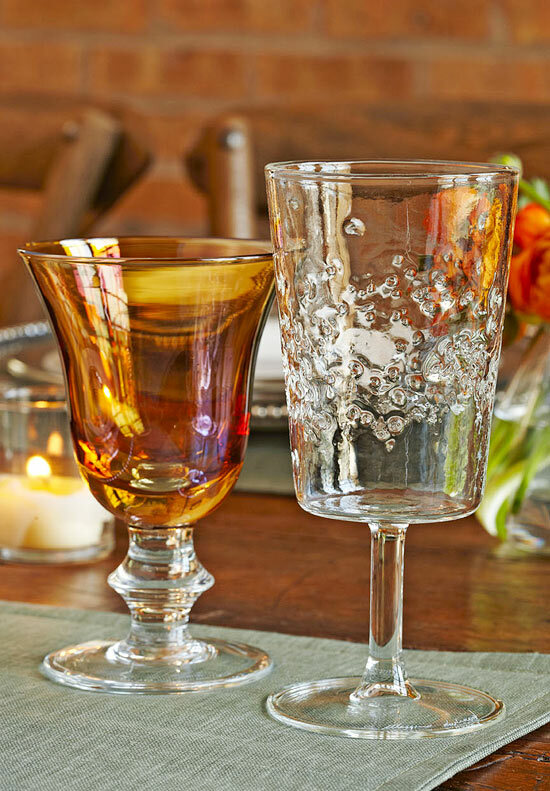 Amber wine goblets and water glasses with bubbles blown into the glass offer textural and colorful departures from the usual clear water glasses. Flatware is also stylishly mismatched. Knives with resin handles made to look like tree bark contrast with the modern sensibilities of vintage midcentury Dansk soup spoons, while orange ranunculus and ferns dance down the middle of the table. All is illuminated by purposely burned-down pillar candles. The Ponterios could have used the carriage house for anything. In fact, it was first outfitted as an office for Becky, but they prefer it as the spot where they celebrate and enjoy their passions for food and wine. 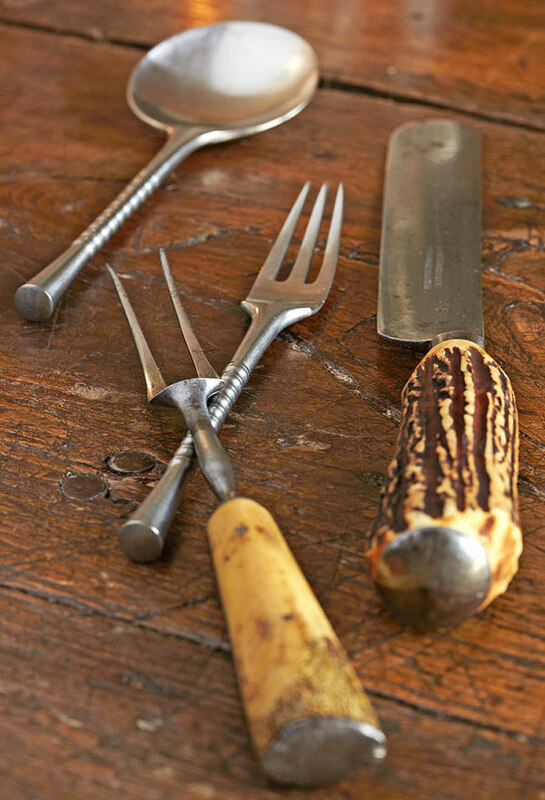 Pick one intentionally mismatched element such as this vintage flatware. “The beauty of vintage pieces is in their imperfections,” says designer Frank Ponterio. 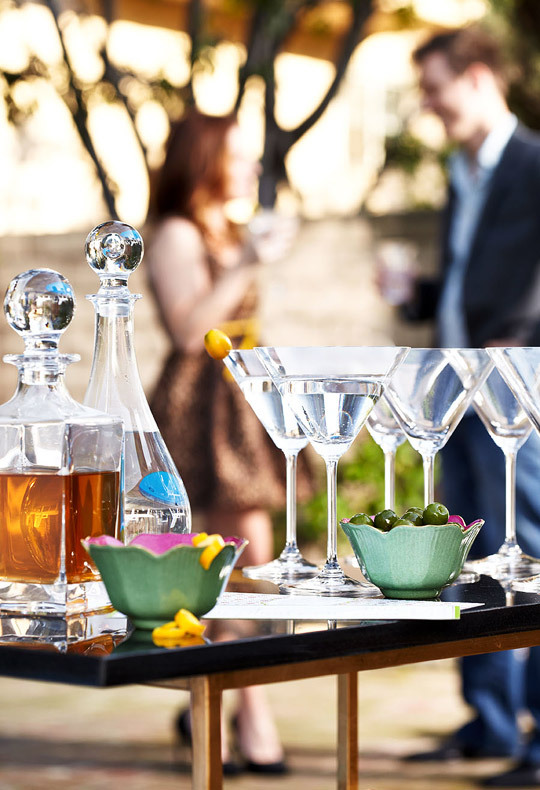 Introduce glasses that have texture and mimic the table’s accent color. The “Ambra,” amber glass and “Minerale” bubble glass are both from Arte Italica. Salt-and-pepper shakers are the perfect opportunity to add a bit of whimsy, like these vintage garlic-head pieces from Frank’s personal collection. Linen napkins and place mats are made of “Arabesque” in Mallard by Rose Tarlow. Roasting the cauliflower before preparing the soup brings out the sweetness in this earthy vegetable. Don’t let it overbrown. This soup can be served as a hearty country-style potage, or thinned with additional broth to a smoother consistency. Thaw scallops, if frozen. Pat dry with paper towels; cover and chill until serving time. Preheat oven to 375°F. Place cauliflower on 15x10x1-inch baking sheet. Drizzle with 2 tablespoons oil; sprinkle with salt and white pepper. Toss to coat. Roast, uncovered, 30 minutes or until tender and just beginning to brown. In large saucepan, heat 2 more tablespoons oil over medium heat. Add onion, leek, and garlic to saucepan. Cook and stir 10 minutes or until soft. Add roasted cauliflower, broth, and cream to saucepan. Bring to boil; reduce heat and simmer, covered, 10 minutes. Cool slightly. With immersion blender, blend soup until smooth, or transfer to blender or food processor, half at a time, and blend or process until smooth. Return soup to saucepan. Season to taste with salt and pepper. Heat through. Add additional broth to reach desired consistency. In large skillet, heat remaining 1 tablespoon oil over medium-high heat. Sprinkle scallops with salt and pepper. Cook scallops in hot oil for 2 to 3 minutes or until brown and just opaque in center, turning once halfway through cooking time. Place one scallop in each serving bowl. 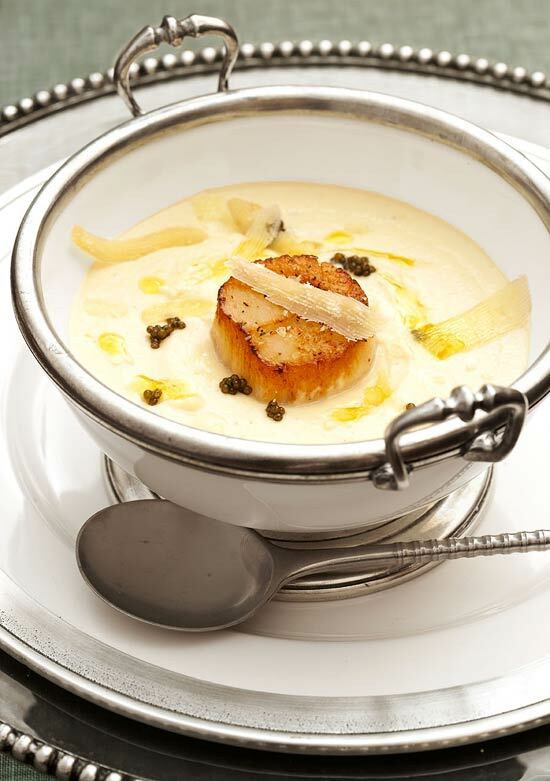 Spoon soup around scallop. Garnish soup with caviar and Pecorino cheese. Drizzle with truffle oil. Makes 6 to 8 servings. This traditional dish has a very simple preparation—and the long and slow cooking process results in fork-tender meat. Risotto is the classic accompaniment—the addition of exotic mushrooms is an elegant, flavorful touch. 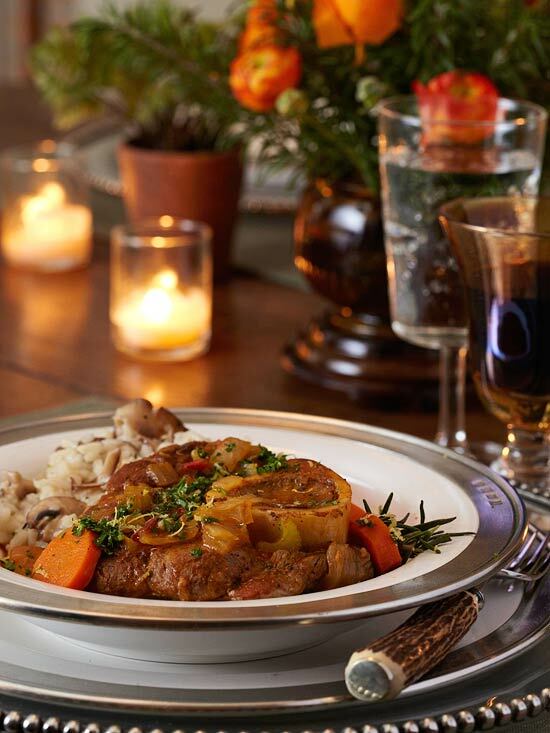 Pre-order veal shanks from your butcher at least one week in advance. Wine: “My favorite Bordeaux, Calon Segur from St. Estephe, is pure perfection,” Frank says. 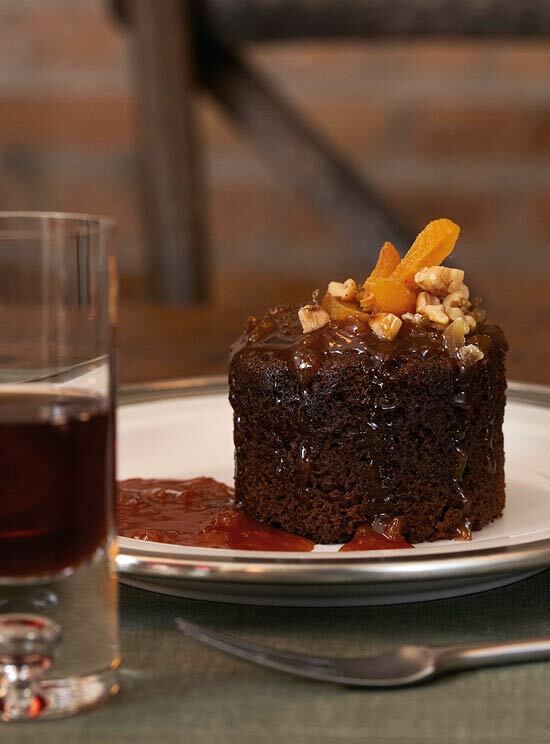 “Because of the how the wine changes in the glass, by the time dessert comes around it opens to be a fitting companion to the complex sweet flavors of the Spice Cakes.” (For tasting notes, visit The Wine Cellar Insider. Preheat oven to 350°F. For sachet, place rosemary, thyme, bay leaves, and cloves in center of double-thick 6-inch square of 100 percent cotton cheesecloth. Tie closed with clean kitchen string; set aside. Remove zest from lemons and oranges and set aside. Squeeze juice from oranges; reserve. Tie veal shanks with clean kitchen string to hold together while cooking. Sprinkle shanks with salt and pepper. In 6- to 8-quart pot (large enough to place shanks in single layer), heat oil over medium-high heat. Add shanks to hot oil and brown on all sides. Transfer shanks to large plate; set aside. Add onions, celery, carrots, and sachet to pot. Cook and stir until vegetables are golden brown, about 10 minutes. Add tomato paste. Return shanks to pot. Cook 10 minutes more. Add chicken stock, wine, reserved orange juice, carrot juice, crushed tomatoes and juice, and reserved zest to pot and bring to boil. Remove pot from heat. Cover pot with tight lid or aluminum foil. Place covered pot in preheated oven. Bake 1-1/2 hours or until shanks are very tender and meat almost falls off bone. Remove shanks from pot; let stand while reducing sauce. Strain liquid in pot through fine mesh sieve. Discard sachet and vegetables. Return liquid to pot. Bring to boil; reduce heat. Boil gently, uncovered, about 25 minutes or until reduced to 2 to 2-1/2 cups. Meanwhile, for gremolata, in small bowl combine parsley, lemon peel, and garlic. Serve shanks with sauce and gremolata. Garnish with fresh rosemary sprigs. Makes 8 servings. In small skillet toast pine nuts over medium heat until golden brown, stirring often. Set aside to cool. 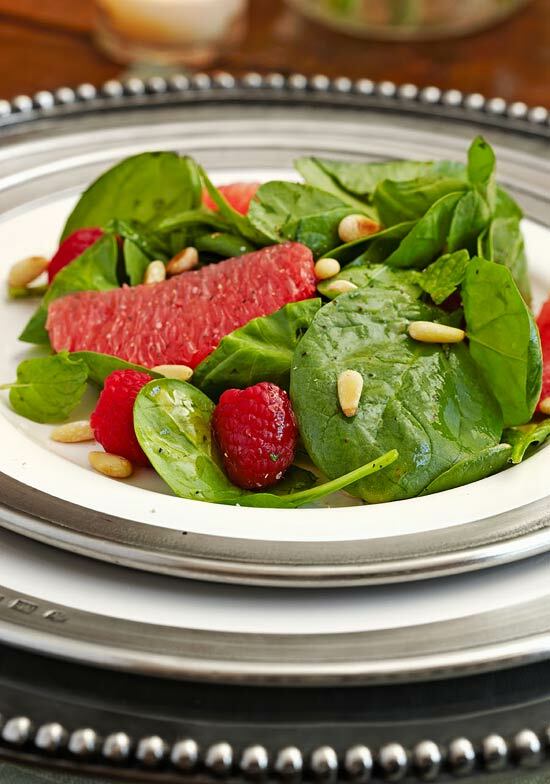 In large bowl combine spinach, raspberries, mint, and grapefruit. Drizzle vinaigrette over salad; gently toss to coat. Season to taste with salt and pepper. Arrange salad on chilled plates; garnish with toasted pine nuts. Makes 6 to 8 servings. Champagne Vinaigrette: In food processor or blender combine 1/4 cup champagne vinegar, 1/4 cup lemon juice, 3/4 teaspoon kosher salt, 3/4 teaspoon freshly ground black pepper, 1 tablespoon minced garlic, and 1/4 cup sugar. Cover; process or blend until combined. With processor or blender running, slowly add 1 cup extra virgin olive oil in steady stream until mixture is thickened. Chill. Stir or shake vinaigrette well before using. Cover and refrigerate for up to one week. Makes 1-2/3 cups. Preheat oven to 350°F. Lightly coat 9 round panettone baking cups* (2 inches tall and 3 inches in diameter) with nonstick cooking spray. Cut nine 3-inch diameter circles from parchment paper; place one in each panettone baking cup. In medium bowl combine flour, ginger, baking soda, allspice, cloves, nutmeg, and salt; set aside. In 1 cup measure combine water and instant espresso coffee powder; set aside. In large mixing bowl beat butter with electric mixer on medium to high speed 30 seconds. Beat in brown sugar until combined. Beat in molasses and egg. Beat in flour mixture in 3 additions alternating with espresso mixture in 2 additions. Mixture may appear slightly curdled. Divide batter among prepared baking cups (about 1/3 cup each). Sprinkle each with 1/4 teaspoon sugar. Place cups in a 15x10x1-inch baking pan. Bake 25 to 30 minutes or until wooden toothpick inserted near centers comes out clean. Cool on wire rack. Remove panettone cups and parchment to serve. Drizzle with Apricot Caramel Sauce. If desired, top each cake with slivered dried apricots, toasted pecans or walnuts, and/or crystallized ginger. Makes 9 cakes. In food processor combine apricots and ginger; pulse mixture gradually adding 2 tablespoons water. Mixture should resemble pieces the size of grains of rice. Set aside. In heavy medium saucepan combine sugar, corn syrup, and remaining 2 tablespoons water. Cook and stir over low heat until combination is liquid. Increase heat to medium-high; boil until syrup is deep amber color (360° on a candy thermometer), about 7 to 8 minutes, brushing down sides of pan with wet pastry brush and swirling mixture occasionally. Remove from heat; carefully add whipping cream and vanilla (mixture will steam). Return to low heat; add butter and apricot mixture. Cook and stir until butter is melted. Remove from heat; transfer to serving bowl. Serve warm. Makes 2 cups. 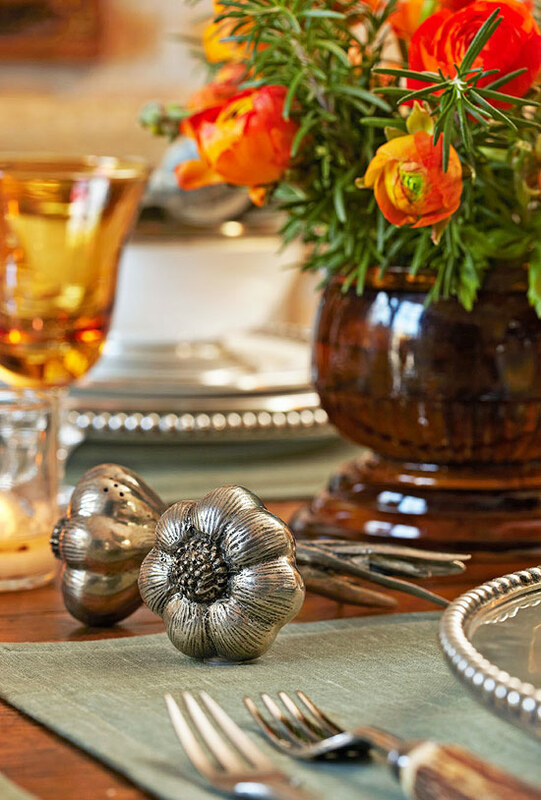 For more ideas—and recipes—for informal entertaining, take a look at this presentation on hosting an Informal Buffet Dinner Party.